This new book of collection of my posts is after the first two editions ‘Sixty Shades of Green: Musings on Sustainability‘ and ‘Blue, Green and Everything in Between: Musings on Life, Love and Sustainability‘. This third edition pulls together another 50 of my blog posts. 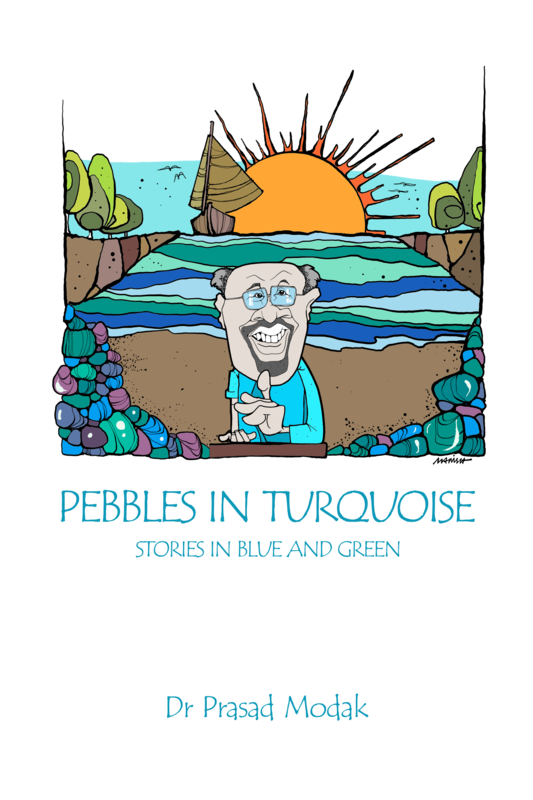 Pebbles in Turquoise – Stories in Blue and Green is a blend between “Green” and “Blue” and a a collection that is like pebbles scattered on a beach. It attempts to create a place where you can chill, listen to the sound of waves and watch the blue sky. The Blue carries my anecdotes from my personal experience with people, places and life. The Green is presented in a semi-fictional and satirical style with sustainability as the focus. As before, the book comes with rich and attractive illustrations (doodles). You can find the book on the website of Amazon, Amazon India and Pothi. The book will soon be available on Flipkart. Avail the Print on Demand Service. What do readers have to say about the articles in this Book?